Who defines good quality research? How, why and with whom should we co-construct knowledge? How do we build enduring partnerships? The articles in this IDS Bulletin aim to answer these questions based on IDS’ approach of ‘engaged excellence’. This is where the high quality of work (excellence) is dependent upon it linking to and involving those who are at the heart of the change we wish to see (engaged). Acknowledging the worldwide struggle of researchers, policymakers and practitioners to create knowledge that is both rigorous in its own right while being relevant and useful to those whose lives and futures are potentially affected by new evidence, insights and concepts, engaged excellence combines conceptually and empirically innovative research with extensive engagement with particular countries and people through IDS’ practices, partners and students. Four pillars of engaged excellence are identified as delivering high quality research; co-constructing knowledge; mobilising impact-orientated evidence, and building enduring partnerships. Uniquely, the articles in this IDS Bulletin bring these together to show that they are interrelated and mutually dependent, with contributors raising challenges around reflecting more deeply on what engaged excellence means in different contexts. The complexity and interrelationships become most real when the four pillars are applied in practice. 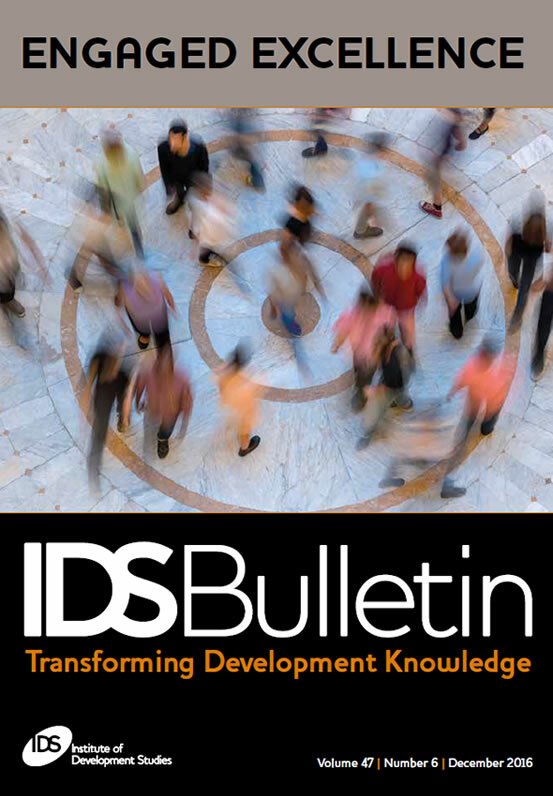 The value of this IDS Bulletin is that it illustrates the challenges, trade-offs and difficulties of using such an approach while contributing to a more cognitively just world in which our research engages with those at the centre of change. Choosing between Research Rigour or Support for Advocacy Movements, a False Dichotomy?